Featuring Thomas Daniels, Don Harris & Katayanagi Twins. With over 10,000,000 combined online streams. 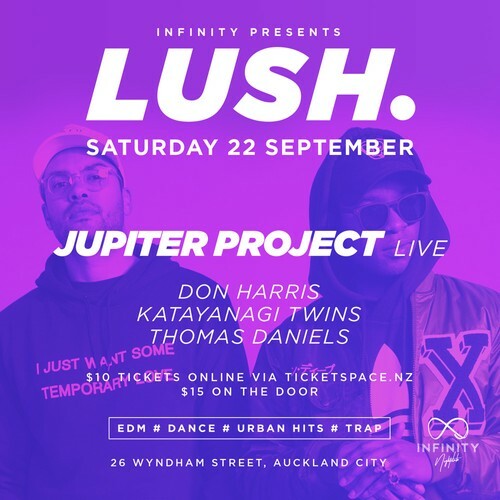 Main Room: Saturday 22nd September, 2018 they will be taking over Infinity Nightclub with the support of Thomas Daniels, Don Harris & Katayanagi Twins. R21 Karma Lounge with DJ09. Marty Rich and Gavin Correia, otherwise known as Jupiter Project, aren’t new to the scene in their native New Zealand. Following the success of their recent singles, the electronic R&B duo are ready to make waves with the release of their eagerly anticipated album. The duo have had international success with their single With You (featuring Jetski Safari & Helen Corry) which achieved Gold Status in New Zealand alongside charting in France and Belgium. The catchy tune has also been streamed over 8 million worldwide. Alongside having their Saturday night mix show on iHeart Radio and ZM, they’re regulars on the festival circuits playing on the main stages at Rhythm and Vines and Our House Festival. The talented duo have also shared the stage, opening acts with the likes of Flume, Will.i.am, Jessie J and Jason Derulo. The boys are known as one of New Zealand’s most prolific song-writers having penned a number of Top 10 hits. After releasing with Universal Music France, the pair embarked on a successful European tour that included performing at Electroshock festival alongside Moby and Rudimental. Following on from their latest hit single Sweet Disguise which has peaked at #1 on the NZ Music Charts, the duo will release their collaboration with European producer Daniel Richard for their take on a much loved classic - My Girl. The track features smooth vocals over a dance inducing production that is set to get dance floors moving to throughout the globe.